By Megan Graham . Published on September 28, 2018. The Outdoor Advertising Association of America launched a campaign this week ahead of Advertising Week to get the industry pumped up about "OOH's power, value and significance in today's digital world." Which explains why you'll be seeing some familiar faces — like Richards' Group founder Stan Richards, Barton F. Graf founder Gerry Graf and Anomaly copywriter Jezz Chung — around the city when you're hustling panels, coffee and cocktails during Advertising Week. 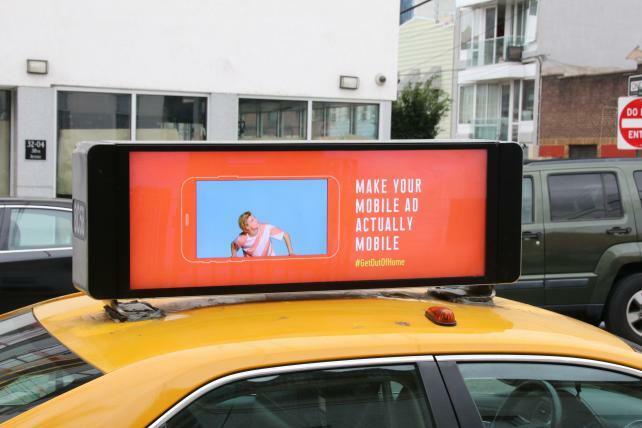 The group's "Get Out of Home" campaign, done with Publicis New York, is meant to target media agencies and planners attending the conference with static and digital out-of-home ads. In addition to NYC, the campaign will hit more than 50,000 out-of-home units in 30 other cities from San Francisco to D.C. Speaking of Advertising Week... I know last week I vaguely promised an Advertising Week poem on the theme of "'Twas the Night Before Christmas" (one of my many questionable middle-of-the-night ideas). But did you know that poem is 56 lines long? I am willing to suffer for my craft, dear readers. But not for 56 lines. However, I am not one to break a promise. And I really love an excuse to troll around on RhymeZone. So, an abridged version. Just call me Santa. 'Twas three days before Advertising Week, can you believe the clock? LifeBridge Health has tapped StrawberryFrog as its agency of record for creative and strategic branding following a review. The Baltimore-based health system includes four hospitals, hundreds of doctors offices and urgent care centers, home health care, pharmacy services and more. StrawberryFrog CEO Scott Goodson calls the company "the disruptive brand in a most traditional category." WPP this week (coinciding with the UN Women's Private Sector and Philanthropic Leaders' SDG-5 Summit) announced its collaboration with UN Women this week including global, pro-bono media support by GroupM and creative support from WPP agencies "to help positively impact the lives of girls and women." This comes after $1 million in pro-bono placements through multiple campaigns "as part of WPP's support for the UN's Sustainable Development Goal" to reach gender equality and empower women. Carat's former global chief digital and data officer James Harris has joined Mindshare as its global chief strategy officer. Sooho Choi, formerly a managing director and senior client executive at Accenture, has joined Publicis.Sapient as senior VP of travel and hospitality. Brendan Condon is the new chief revenue officer at Comcast Spotlight, the ad sales division of Comcast Cable. He was formerly president at AdMore. FCB has named Taylor Yarbrough as its new associate global director of global culture and inclusion. She was previously manager of diversity and inclusion strategy and talent development at the 4A's.